With a killer concept and some pretty wild and scary plot twists, this is one thriller that really holds you on the edge of your seat. A pretty horrific and entertaining movie, this film is built on simplicity, with a plot that is bare bones all the way. The story is about three friends caught on a ski lift after the resort has shut down for a week. They are too high up to jump down and find themselves facing all kinds of unexpected threats, from their vulnerable position. The characters here might be a little two dimensional, but the scares are real and the situation is freakishly believable. At least the movie convinces you that it is. Frozen is a very compelling and haunting movie. It’s incredibly entertaining, and yet at the same time, this movie is definitely not for everyone. First off, it’s unconventional in the sense that there are really only three characters, and most of the movie takes place in one location, on a chairlift, (definitely the kind of scaled down situation that could make for a play.) 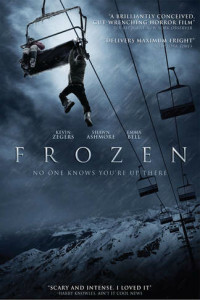 Now what happens on that chairlift is thrilling, but if you need your characters to move around a lot and have lots of relationships and action and things like that, then this movie is not for you. For those with patience and the ability to take in something different as kind cool, (like the movie Locke, which took place in its entirety behind the wheel of a car,) this movie is just right. It certainly is creative in ways that most movies don’t dare to be. This one works, among other things, because of how simple it is. At least regarding its initial premise. Three college-aged kids are out at a popular ski resort for a day of hitting the slopes. All things seem to be going well until they find themselves stuck on the ski lift in freezing temperatures, knowing that the resort won’t be opened again for a week. From that moment of realization on, things only get worse for these characters. It’s Alive scaled down to the bare minimum, and that approach works better than one might expect. This is certainly a “what would you do,” kind of movie, much like The Shallows, the Blake Lively shark movie, or most other realistic, but horrifying situation movies. Like that film, this one gets right to the point. We meet the characters while they are standing at the bottom of a ski slope, planning out a little ski lift scam to get up on the mountain by paying the smallest amount they possibly can. So it’s not as if the movie starts with the threat or anything, but it does start with a shot of the characters looking at the ski lift, in the middle of a conversation, ready to spring into action on their plan. The characters are Joe, (Shawn Ashmore,) Parker, and Dan. Parker and Dan are dating and Joe is the third wheel friend. The three of them stand around watching the chairlift employee and planning a routine. Apparently they had a whole thing figured out, expecting the chairlift person to be a girl that they knew, and have now been thrown for a curveball. The chairlift employee has changed to this new guy, and suddenly they need to rethink their entire scam. They end up sending Parker over to talk with him and offer one-hundred bucks in exchange for looking the other way about the fact that they don’t have ski lift tickets. And so the three of them start their day of skiing together. It will be a little while before we actually get to the chairlift incident, and that’s a good thing. We definitely need a couple of scenes to establish these characters and their relationships, (two dimensional as they are,) and now we get them. Dan and Joe are best friends and have been since they were little kids. Every year, the two of them go skiing together. Dan just started dating Parker about a year ago. Now she is coming along for one of these ski trips and Joe isn’t too thrilled about it. There’s a really funny scene where Joe is telling Dan exactly how he feels, with the two of them sitting at a table in the cafeteria area of a lodge, when Parker comes walking up behind Joe to hear the conversation. Joe tries to cover for what he was saying, and the result is humorous. The three of them approach the ski lift guy, (the same guy who they bribed earlier,) and they convince him to let them go in one more run. We see how the place keeps track of when to shut the ski lift down, placing an orange cone on one of the chairs, and waiting for that chair to come back around, indicating that the ski lifts have all gone around a full cycle with nobody being on it. Only that orange cone chair has already been sent off when the guys convince the employee to let them go. And then we see how this employee is called into the office to speak to the manager about an upcoming work day issue, and how someone else takes over. The man who takes over is told to look out for “three more, on their way down.” And three people do come down, only it’s not our three characters. And just like that, the ski lift is turned off. At first, our characters think nothing of this. After all, when they were on the lift before, during the daytime, there was a moment when the lift stopped for somebody having trouble getting on at the bottom of the hill. That was foreshadowing 101. It was a false alarm. This time it’s for real. Our characters learn this when all the lights on all the slopes suddenly get turned off and they are left there in the dark. This is when the real scares kick in. What happens next is a thrill a minute ride. Each character tries his or her own method of escape. Dan tries jumping from the lift while Joe tries climbing the wire that connects the chairs, hoping to get to one of the huge poles that hold the chair lift wires up. If he can reach that, then there will be a ladder for him to climb down. Only there’s a problem… the wire is cutting through his gloves and into his hands. Things aren’t much better for Dan on the ground. Let’s just say, he’s got the threat of wolves to deal with. There are some pretty terrifying moments here, and the movie handles them really well, carefully deciding on what to show us, and what is better left to our imaginations. On that note, there’s one of these decisions that the film doesn’t quite get right, when a character goes down the slope on his own and we don’t follow him, staying up on the chairlift instead. It should be a rule of movie writing to stay with the more exciting situation. Luckily the film does make amends for this, at least partially, by revealing that character’s fate to us later on. But overall this film works. It works because of its simplicity and it works because the scares are real and make you feel like you could be there, in the shoes of these characters, and wouldn’t be able to do a thing about it.